The next set of tools to introduce is profilers. As opposed to the tools introduced in previous sections, GC-related areas are a subset of the functionality that profilers offer. In this section we focus only on the GC-related functionality of profilers. The chapter starts with a warning – profilers as a tool category tend to be misunderstood and used in situations for which there are better alternatives. There are times when profilers truly shine, for example when detecting CPU hot spots in your application code. But for several other situations there are better alternatives. This also applies to garbage collection tuning. When it comes to detecting whether or not you are suffering from GC-induced latency or throughput issues, you do not really need a profiler. The tools mentioned in previous chapters (jstat or raw/visualized GC logs) are quicker and cheaper ways of detecting whether or not you have anything to worry about in the first place. Especially when gathering data from production deployments, profilers should not be your tool of choice due to the introduced performance overhead. But whenever you have verified you indeed need to optimize the impact GC has on your application, profilers do have an important role to play by exposing information about object creation. If you take a step back – GC pauses are triggered by objects not fitting into a particular memory pool. This can only happen when you create objects. And all profilers are capable of tracking object allocations via allocation profiling, giving you information about what actually resides in the memory along with the allocation traces. 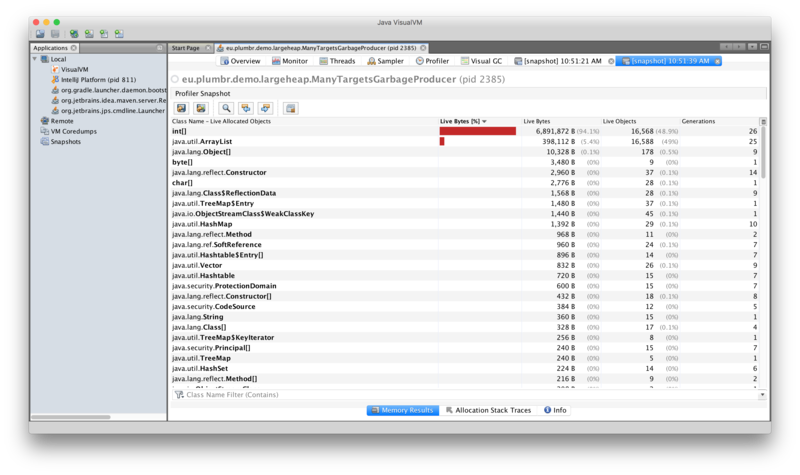 Allocation profiling gives you information about the places where your application creates the majority of the objects. Exposing the top memory consuming objects and the threads in your application that produce the largest number of objects is the benefit you should be after when using profilers for GC tuning. In the following sections we will see three different allocation profilers in action: hprof, JVisualVM and AProf. There are plenty more different profilers out there to choose from, both commercial and free solutions, but the functionality and benefits of each are similar to the ones discussed in the following sections. JVisualVM makes a second appearance in this chapter. In the first section we ruled JVisualVM out from the list of tools monitoring your JVM for GC behavior, but in this section we will demonstrate its strengths in allocation profiling. Open the “Profiler” tab and make sure that under the “Settings” checkbox you have enabled “Record allocations stack traces”. Click the “Memory” button to start memory profiling. Let your application run for some time to gather enough information about object allocations. Click the “Snapshot” button. This will give you a snapshot of the profiling information gathered. Compared to hprof, JVisualVM makes the information a bit easier to process – for example in the screenshot above you can see that all allocation traces for the int are exposed in single view, so you can escape the potentially repetitive process of matching different allocation traces. Last, but not least, is AProf by Devexperts. 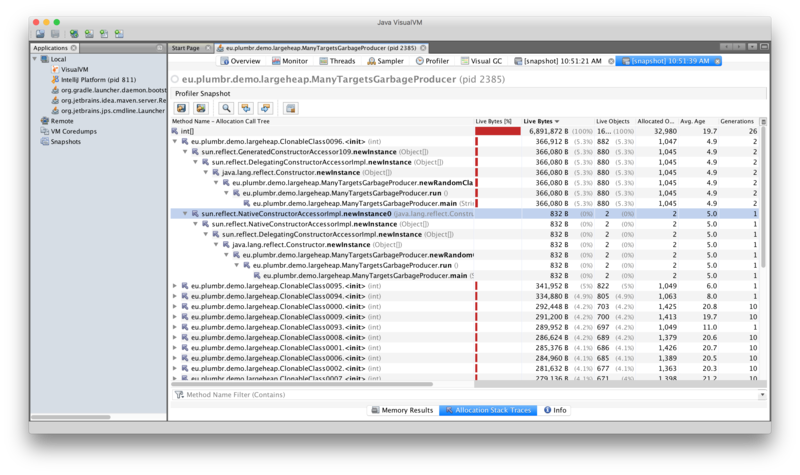 AProf is a memory allocation profiler packaged as a Java agent. In the output above allocations are ordered by size. From the above you can see right away that 80.44% of the bytes and 68.81% of the objects were allocated in the ManyTargetsGarbageProducer.newRandomClassObject() method. Out of these, int arrays took the most space with 40.19% of total memory consumption. From the above we can see the allocations for int arrays, again zooming in to the ClonableClass0006 constructor where these arrays were created. So, like other solutions, AProf exposed information about allocation size and locations, making it possible to zoom in to the most memory-hungry parts of your application. However, in our opinion AProf is the most useful allocation profiler, as it focuses on just one thing and does it extremely well. In addition, this open-source tool is free and has the least overhead compared to alternatives.